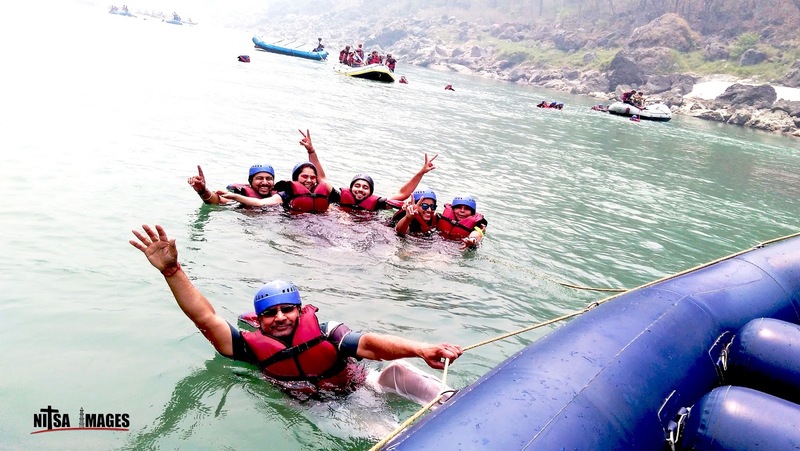 As our eyes opened on sandy beach, first thing in front of us is a raft sailing into river Ganga. Its 7:00 in the morning and we were instructed by camp manager to be ready by 8:00 AM. After admiring the beauty of nature and eating our breakfast, we went again on hilly road which goes back to where our car is parked. We were taken in groups to the point from where our journey to adventurous and fearful rafting going to start. At around 9:00 AM we reached another point, Here water is deep and river is broad. I can see around 20 rafts waiting to start their journey. We were given life jackets and helmets that is red and blue in colour (Very picture friendly). We were allotted a guide “Rakesh”, he gave us few instructions. Around 10:00 AM we put our raft in river and hop inside. After only 5 minutes, noise of water starts increasing and we were heading towards huge waves of water. 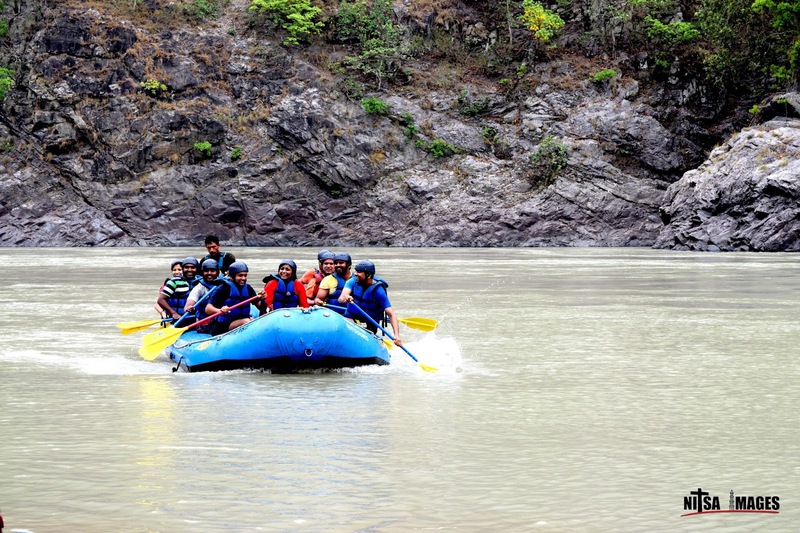 Voice of Rakesh pop into our ears “row forward fast” – This is a command to start paddle. Here we enter the tides in river. Around 10 feet high and ready to swallow us in. I am at the front seat, when tide came i can actually see our raft up in the air and water around 10 feet below us. Within half minute rapid is over and again we were in calm water. But the feeling of this half minute of adventure is thrilling. Around 7 to 8 rapids all with the similar feeling (get use to it after 2nd rapid). Then to my surprise, Rakesh told us to jump in the water and swim. The idea to jumping into water itself is thrilling. Without wasting much time i jump into water and spend some fun time swimming and relaxing in cold water. Near Ram Jhula- Rishikesh, we parked our raft at around 2:00 PM. Do some photo session and went back to our cars which were taken to parking lot in Rishikesh (Facility provided by camp manager). Thanks to them.